Note: Divisions 8 through 14 now have a 4 year age span, Division 18 has a 5 year age span. Division 13 is now Division 14. Division 15 and Division 18 have merged. Division 18 is all music at all skill levels. * 14 year old athletes on division 18 must be in high school. Road to the National Championships. Each year, over 200 Cheer, Dance and Step squads, across all AYC divisions, compete for a National Championship Title in Kissimmee, Florida, home to Universal Studios Orlando, Islands Of Adventure and Disney world. For more information please visit AYFchampionships.com. AYC has eight regions including Desert Pacific, Mountain Northwest, Midwest, Southwest, Big East, Atlantic, New England, and Southeast. Each region hosts a regional tournament, which is the qualifier for the National Championships. (Learn about your region.) The top 3 teams in each division will win a bid to compete for a national championship. Regional championships occur in the weeks leading up to Thanksgiving weekend. Each region is responsible for scheduling their own Regional Cheer tournament. Our Sponsors are the most commited , only as a member of AYC, will you receive discounts on Team Leader® uniform & poms and coaching resources by ASEP. An experience like no other. Select AYC seniors are invited to sideline cheer and perform at halftime at the AYF 8th grade all-star football game. Developed by the American Sport Education Program (ASEP) in conjunction with American Youth Cheer and Varsity, the course kicks off by examining some coaching principles designed to improve your skills in the areas of practice and competition-day planning, communication with squad members and parents, safety and first aid, and squad-member training to promote lifelong fitness. In the second half of the course, you’ll learn the basic cheer techniques and how to teach them effectively. In an interactive format, you’ll see proper ways to perform various maneuvers and how they’re employed in routines. 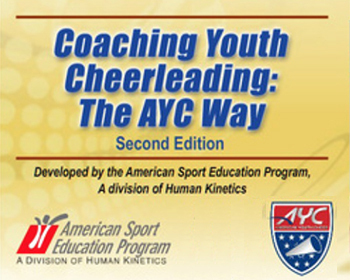 The course includes the e-book Coaching Youth Cheerleading, written by ASEP in conjunction with Varsity Brands. As part of the final unit of the course, you’ll take the CDC’s Head’s Up: Concussion in Youth Sports course, used as a training resource for thousands of sport organizations across the country. After completing course activities, you’ll take the 35-question online course test, which covers material from the book excerpts and the online course. AYC Cheer Camps & Clinic are the best way to kickoff your cheer season. Day & Overnight camps have a customized curiculum which promotes techniques, teaches stunts within the AYC rules. Prepare yourself in the best way possible for a great season and a National Championship. AYC's Regional & National Championships are your place to shine.